THERE IS A fascinating puzzle about the Royal Arch. No, not whether it was ever part of the third degree (we can say with certainly that it never was) but why it has been adopted by so many other orders, in that you have to be a member of RA in order to join them. So why is it that the likes of Royal and Select, Allied , Masonic, Red Cross, Knights Templar, Priests, Baldwyn, The Operatives, CBCS and many other orders, require the Royal Arch as a condition of entry? And why have so many orders outside Freemasonry embraced it in the past? Even the very latest order, the Masonic Order of Athelstan, which came into being only this year, has a pre-requisite to joining -you have to be RA. Why? I am not a historian, so this is not an academic paper. But I like to think it might stimulate some brethren into looking at the subject in greater depth, so that we can unravel the secret of the RA's abiding popularity with other orders, even those outside the Craft. 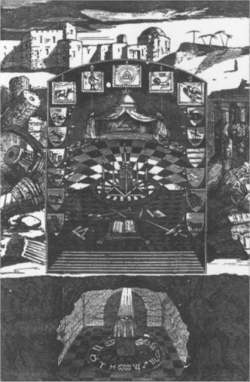 The first hint of the considered importance of the Royal Arch degree, came from Laurence Dermott, who insisted that it was the 'root, heart and marrow of Masonry' -strong stuff at a time when the Original Grand Lodge (of 1717) insisted (as it did for around 70 years) that it was just 'an innovation designed to seduce the brethren'. Which it certainly did, to this day. What possessed Dermott to speak so highly of a degree derided by the Original Grand Lodge? First we must bear in mind that this has nothing to do with 'what was lost' in the Craft third degree and the RA. They are entirely different. I understand that there is an article on The Word in this issue, so I won't dwell on this aspect. Through the masonic ages, the RA theme has been a popular one for some reason. 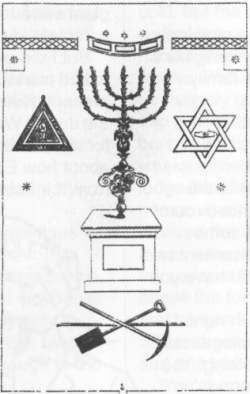 Going back at least to the early 1800s, Mackenzie mentions the Grand Royal Arch, Ramsay's Royal Arch, the Royal Arch of Enoch, the Royal Arch of Solomon and the Royal Arch of Zerubbabel -and there were and are many others. Even the Druids at one time adopted a Royal Arch degree which is/was remarkably similar. I read in this very magazine recently, that in Cole Court Masonic Hall there is a Druid Royal Arch certificate, and a jewel collar that has absolutely identical markings to that of Royal Arch in the Craft. Surely this is more than a coincidence. I am at the moment trying to discover just what that Druid Royal Arch ceremony was like, without much luck. If anyone knows anything about it, I would be grateful for the information. But I got lucky with the most impressive comparison I have found, one that included the Oddfellows. Now regular readers have had this organisation described in this magazine, so I won't go into too much detail. The Odd Fellows (as they were) date back to the early 1700s for certain. There have been many 'schisms' and thus many versions of the order. The oldest surviving ritual we have is that of the Order of Patriotic Odd Fellows, which was issued in 1797. What's more, it has been re-published recently. In those days, the degrees within the Odd Fellows consisted of the Covenant or White degree, the Royal Blue, the Pink or Merit - and the Royal Arch of Titus! Now of course the fact that it has Royal Arch in the title does not prove anything. But let us take a look at the ritual book. Before uttering anything, six of the officers take their places. Three -Ancient Grand Master, Noble Grand Master and Vice Grand Master- stand 'as if occupying the three points of an equilateral triangle'. Three others -Grand Warden, Grand Secretary and Grand Treasurer -'occupy similar positions forming also an equilateral triangle, intersecting the other.' Note that these intersecting triangles form the hexalpha or six-pointed star sign for the Royal Arch! There is a seventh officer in this ceremony, the Grand Guardian, who is 'within the lodge'. Presumably at the door. The ritual then goes on. AGM: In whose presence are we met tonight? NGM: In the presence of the Holy One of Israel, who must not be named with unhallowed lips. Let the Ancient Grand Master start to letter the name, that we, as the seven principals, may recognise the name. Later, in the dark, each of the first six officers stand in their intersected triangles and each lights his lamp. It must have been very impressive. Now I am sure you will agree that we have even more coincidences here. So much so that it must be accepted that the Royal Arch degree has permeated at least two orders outside Freemasonry. Why? What is it that made orders from seemingly non-associated groups adopt not only part of the regalia (Druids) but also the ritual (Odd Fellows) of the Royal Arch. What lay behind Dermott's words when he said that the RA was the 'root, heart and marrow of Masonry'? All we can be sure of, is that it was something the Original Grand Lodge didn't know, or didn't want to know, about. It certainly is a mystery.